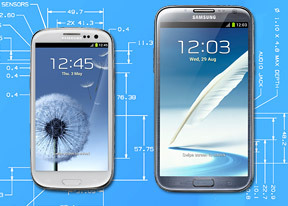 The Galaxy S III and the Note II are both cut from the same cloth, but one is XL while the other is XXL. What can we say - someone at Samsung must be busy spinning and weaving. Size matters as it always has but this isn't a choice between slim fit and loose fit. It's the Android experience and it must be the perfect fit - so another close-up look at both may be well worth it. And mind you, this isn't about which one is better - the phone or the phablet - it's about which one looks good on you. It's hard not to look at the Note II as an oversized Galaxy S III, but a few minutes with the S Pen might convince you otherwise. The bigger screen (with a new Super AMOLED matrix to boot) and overclocked chipset are pretty sweet too. 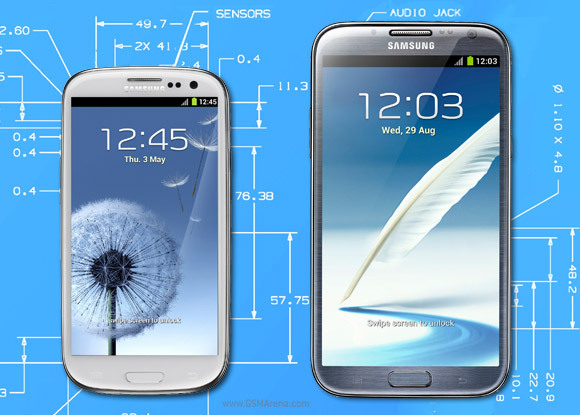 On the other hand, 4.8" is plenty for a phone and the S III is a root away from the extra clock speed if you're a power-obsessed geek. Plus, while the screen uses a PenTile Super AMOLED matrix, it does handle sunlight better. And styli went out of fashion years ago, right? We're about to delve into the details, but if we had 10 seconds to summarize the differences between the S III and Note II, here's what we'd tell you. Bigger screen - 5.5" vs. 4.8"
While mobile devices are typically good at content consumption but not creation, Samsung is trying to break that barrier with the S Pen. The split-screen interface also promises improved productivity. Still, the Galaxy S III is lighter on the pocket (in both the physical and monetary sense) and is pretty much the same device in terms of software and hardware (sans the S Pen). Here's the roadmap for this comparison - we start off with the hardware, including the screen and battery life, then we move on to software and benchmarks, compare the cameras and finish off with the audio quality. Press next to begin. your galaxies could be more valuable if they might have water resistance and dust proof. so you add that.